Today’s post is written by Patricia Woodside, a finalist in The First Ever Write It Sideways Blogging Contest. Welcome, Patricia! Writers are risk takers. Writing requires taking risks. Sure, some writers will say they are introverts or maybe that they avoid taking risks, but they’re lying. Yes, lying…to themselves, and maybe, to their readers. Writing is a bold and courageous act. Every time you type or scribble a word, you’re taking a gamble. Is it the right word to convey your intended meaning? Is there a better word, one more likely to resonate with readers and catapult your writing from good to great? There’s an old adage that says ‘there’s nothing new under the sun’. If true, writers face a death sentence. Writers must find new stories, or find new ways to tell old ones. Secret baby? Hot, alpha billionaire starts over after losing it all? Killer stalks sleepy, small town? Young boy discovers he’s part wizard and goes on to face epic battle between good and evil? It’s been done. What do you have to say that makes your story different? Are you conscientious in your story choices, raising the stakes and nailing the pacing, or…are you too careful, too safe, robbing your story of style and verve and causing it to fall flat upon the page? It’s the story of your heart. You’ve convinced everyone—your crit partners, your contest judges, your agent, the publishing board—to take a chance on this story. On you. But the reading public is as unpredictable as a flash flood, and your book doesn’t sell. Was it the packaging? The marketing? The writing? The story? You may never know, making it hard to convince the Almighty Publishing Sages to take a chance on you again. Do you continue to write and seek publication or do you cast aside your character charts and plotting aids deciding it wasn’t meant to be? Writers abound whose hopes and expectations have disintegrated in the hot lava of publishing uncertainties. To a certain extent, new writers can elect to hide behind the shield of ignorance. Burning with excitement, if they strike out with little knowledge of the publishing industry to get in their way, they sometimes manage to catch lightning in a bottle and achieve success beyond their wildest dreams. For most writers, the road is long and tedious, and the risks are as real and big and scary as the Pacific’s Ring of Fire. After ten years of writing, I’m not exactly sure whether to call myself a new writer anymore. I certainly can’t claim industry ignorance. I’ve published a handful of short stories, blogged three to five times per week for the past five years and written over 80 freelance articles. I read every tidbit of publishing information that comes my way, intent on keeping up with the trends and changes in this Willy Wonka-like business. But the writing of my heart, my novel, remains as elusive as a blue unicorn. I could offer a host of reasons why. Some are certainly valid, unavoidable impediments that kept me from finishing and perhaps publishing a full-length book. Others were self-imposed, born of my own fears and idiosyncrasies. If I’m honest, and I need to be because dishonest writers are rarely good writers and I’m striving to be good at this craft, risk avoidance has gotten in my way. Recently, I’ve made some changes in my approach and am working harder to achieve my dream. I’m taking some risks. Time will tell if they pan out in my favor. Want to join me? If you have been holding back, afraid to step out of your comfort zone or hiding behind a litany of excuses, I challenge you—whether you’ve written for a week or twenty years—to take a risk. Now. Commit to one action, one change that swirls the bile in your stomach and makes your skin crawl, but also will likely thrust your writing forward. Prioritize your writing tasks over other activities. Hole yourself up to write in a place with no interruptions. Submit your work to a critique group. Meet with an editor at a writing conference. Send a query to an agent or a publisher. Release your ebook. 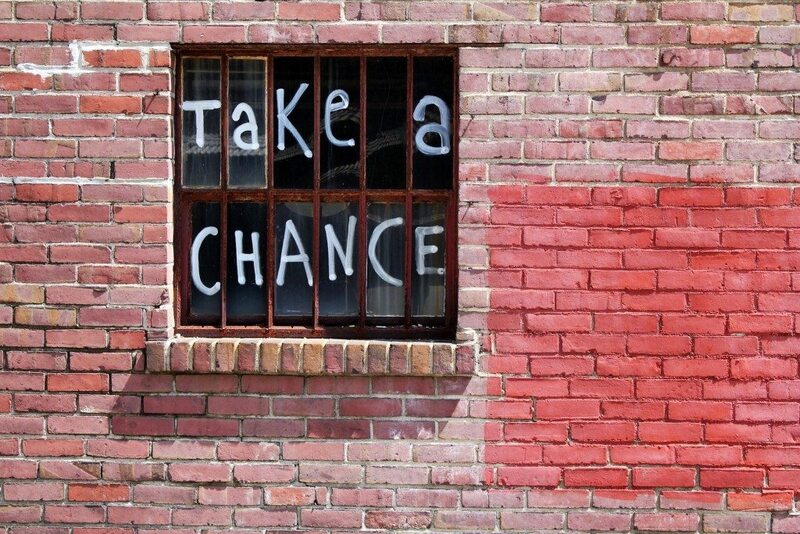 In short, take a chance. To parapharase a familiar camp song, there’s no getting around it and no getting over it, you gotta go through it. Writers have to take risks to be published. Take a chance with your words, your stories…your writing. Freelance writer Patricia Woodside pens articles on business, personal finance and health topics, along with articles geared to writers. An avid reader, Patricia reviews books on her blog as well as for FreshFiction.com. This short story author and hopeful novelist dreams up inspirational romances when not enjoying the central FL sunshine with her husband and three sons. Follow Patricia on Facebook and Twitter, and subscribe to her blogs Readin’ N Writin’ with Patricia and It Starts with Me. I absolutely love this post! As an introvert, I have never understood why people don’t think I take risks. I do all the time. I took a risk making the decision to marry my husband while still in college, when everyone else I know is waiting until after college. I took a risk moving down to San Antonio three days after I got married, not knowing anybody other than the military folk my husband words with. I take risks every day. But mostly, I have begun taking risks with my writing. This contest is the first writing contest I have ever done. I have a huge fear of rejection, but I decided with this, I would take the risk. In my opinion, the benefits heavily outweighed loss. Wonderful, wonderful post. I see why you, too, were chosen as a finalist. Ashley, I find that it’s often one of those gray areas. Some people are bold in one area of their lives while timid or fearful in others. The trick is to harness that boldness and apply it to our writing. I’ve begun to do that and reap rewards as a result, like this guest post. Loved you post, Patricia … it goes to the core of a writer’s fear of failure. I remember reading about a famous Broadway star who had to throw up before every performance. No matter how many years she performed, the fear of failure remained so strong, she could not over come. You’re welcome, Florence. Remember, that fear of failure and fear of success are two sides of the same coin. The common part is the fear. Doesn’t matter what we fear as long as we’re willing to take steps to overcome it and move forward. Great advice. I take risks in my personal life and need to do the same in my writing life. One new risk I’ve taken is blogging which is out my comfort zone because I’m such a private person. I’m finding that I love sharing and joining a larger conversation, though. Now I just need to take risks in my fiction, too. Thanks for sharing this! Miss GOP, pretend you’re having one of those larger conversations when you write. Just let go and have fun with it! One of the biggest risks I’ve had to take with my writing is to continue submitting a story that’s already been rejected. When I wrote my first short story that I felt was publishable, I sent it to a magazine which didn’t accept simultaneous submissions. Like a good girl, I waited for a response before sending it out anywhere else. But, when the story was returned to me rejected and covered in red marks, I never sent it out again. I couldn’t risk another rejection. So, I wrote another story and submitted it to a national writing contest. When I didn’t win the contest, I was then free to submit it elsewhere. But, I’m ashamed to admit I wrote that story in 2008, and I didn’t pluck up the courage to submit it elsewhere until recently (after some editing)! The thought of being rejected again paralyzed me for years. It wasn’t that I was afraid to write something new, or even afraid to submit something new–it’s just that I was afraid to resubmit those already-rejected stories to other magazines. It was as if one rejection equalled rejection by all. Now I know that’s plain silly, and I’ve been holding myself back. You’re so right–writing is a risky business! Thanks so much for sharing this article with us. Not silly at all, Suzannah. A lot of women writers, I find, succumb to “good girl syndrome”. I know I do. We follow the rules, we wait politely, and often silently, then we allow rejection to kill off pieces of our spirit. I always admire those who don’t, which I think is why I’m really high on debut authors and on those who are now blazing e-publishing trails. Time for all of us to blaze our on paths! The fear of one or any of these risks can be paralysing… it’s important, as you say, to “go through it”. We must believe in our writing and in the fact that the more we put out there and the more feedback we open ourselves up to, the more our writing will improve. Belief in ourselves and our writing makes all the difference, Gemma! Thanks for commenting, Sewa Mobil. Keep taking chances, Debra. I’ve found the writing community to be very supportive. What’s your blog url? This completely resonates with me. My personality type is known to crumble with criticism, so I’ve always been afraid to take the plunge with my writing. Not to mention the risk to your dreams. I mean, who wants to meet their dream man face to face to have him look at you and say, “Meh.”? Yet, I’ve recently decided to take that plunge. Posts like this let me know that I’m not alone in my feelings. Thank you. Many little girls are not encouraged to take big risks, rather to play it safe and be cautious and calculated. Writing flies in the face of that, Amberwest. Plunge away! You’re not alone. Great article, thanks. I’ve been struggling as a new blogger and “wanna-be” writer as to where to seek feedback. This was very helpful. Shannon, I’ve struggled with the “wannabe” feeling for years. Don’t! If you write, you’re a writer. How far and how fast you go is up to you. Sorry I couldn’t be here on Monday. I’ve been out of town for an unexpected funeral. But thanks for stopping by, everyone. I’ll be on the road for the next two days but I’ll try to stop in. Thanks for all the great comments. I hope you all take one more risk as a result of reading this post. I’ll take one more as a result of your support. Great post! For me, I’ve taken risks little by little, mostly by remembering the old “what’s the worst thing that can happen?” adage. But, there are still risks I’ve avoided in my writing, like showing up at a Writing Conference and meeting an Editor or Agent in person. Yikes. Your post is a reminder to put those goals on my “to do” list (or my “just do it” list). Thanks! There’s always this struggle to find my genuine most voice, and sometimes momentary blocks can be welcome too !